A24 has become a go-to studio when it comes to movies that feel "must-see," putting out a host of unique and intriguing films each year. But their output has grown to the point where even they are putting out films that slip under the radar and get lost in the flood of stand-out movies. 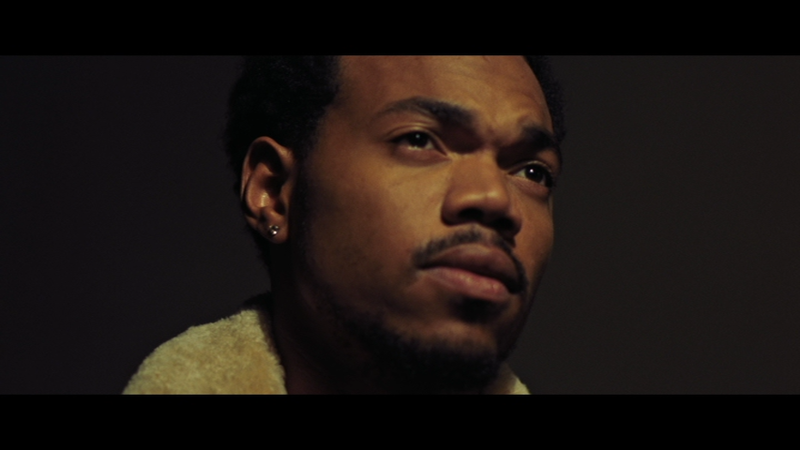 That's exactly what happened with Slice, the feature debut of writer/director Austin Vesely and Chance the Rapper. Sure, the film--as I'll explain--is not exactly mainstream catnip, and wasn't likely to set the box office on fire, but there's no reason why it couldn't have found a much bigger audience than you could get from a one-night, 21-city release. Now that the film is out on DVD (and digital), there's an opportunity for fans of offbeat genre films to see what they missed. As explained in an efficient bit of exposition early on, Slice is set in a world where ghosts walk around like the living (just looking ashen and bearing the marks of their demise) and witches, werewolves and demons are accepted as part of reality. In this world, the mayor of the small town of Kingfisher, Illinois (the always delightful Chris Parnell) has moved all of the ghosts to the nearby neighborhood of Ghost Town. And now, pizza delivery guys bringing pies to Ghost Town are being killed, raising suspicion of the ghosts, while fingers are being pointed at a scooter-driving werewolf named Dax (Chance Bennett). Meanwhile, there's a group of fanatical busybodies--led by Vera (Marilyn Dodds Frank)--trying to get the pizza place shut down because it was built on the site of an old asylum that abused its patients, and a reporter named Sadie (Rae Gray) is trying to figure out what exactly is going on in Kingfisher. The story has a few twists here and there, as most of those involved aren't what they seem, and there's a very real chance of forces of evil taking over the earth. As big as those stakes are, a cartoony sense of reality keeps everything consistently light, to the point where when one character is killed, they react to it with nothing more than a sense of annoyance (considering the difference between living and dead is so slim certainly helps with that.) 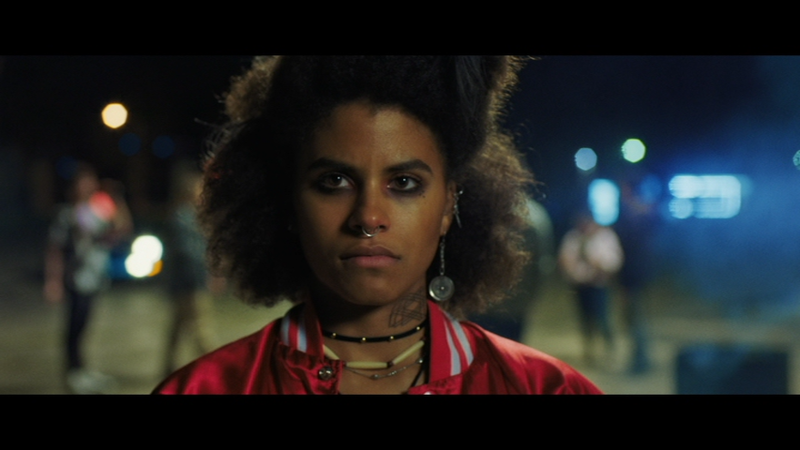 It's something like a live-action Scooby-Doo mystery, with Dax, Sadie and former pizza deliverer Astrid (Zazie Beetz) all on the case to find out who is offing pizza people and why. From the opening titles--a phantasmagorically animated sequence that sets the mood perfectly--to the lo-fi insert commercials, the film is wonderfully stylistic, aided by the synth-heavy score courtesy of Ludwig Göransson (, Black Panther) and Nathan Matthew David. Having that feel and heighten dialogue adds to the surreal tone, which helps sell the concept, an idea that easily could have fallen flat in the wrong hands. And as good and memorable as the film is overall, the climax--likely due in large part to budget--just doesn't really land the way it should, and risks tanking the entire movie (though it recovers nicely.) It shows the risk of trying something very different and how small the landing pad is when dealing in the offbeat. Fortunately for Vesely and company, they hit the target more often than not. Sadly you can only get a physical copy of this film on DVD, but at least you can get a physical copy at all. The disc arrives in a standard keepcase, with a simple animated, anamorphic-widescreen menu offering options to watch the film, select scenes, adjust the languages and check out the extras. AUdio options include Dolby Digital 5.1 English and English Descriptive tracks, while subtitles are available in English SDH and Spanish. The anamorphic-widescreen 2.40:1 transfer on this disc looks quite good for standard definition, with a clear image and a decent level of fine detail, and color that looks good no matter the scene, as the film features earth tones, deep reds, garish neon hues, and just about everything else. 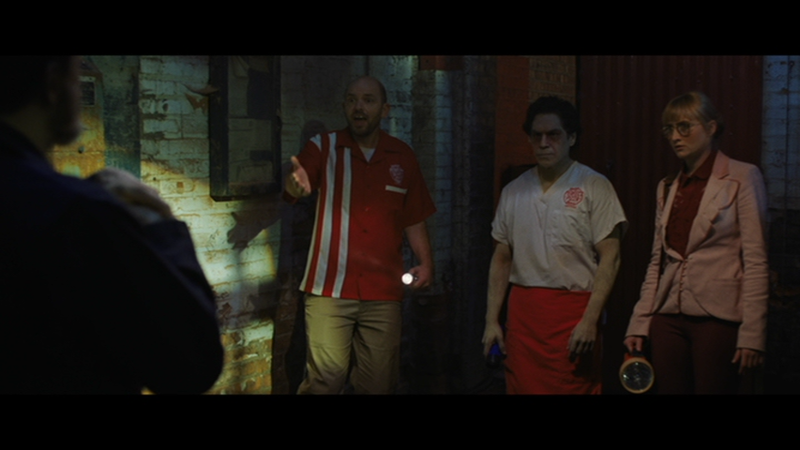 Much of the film takes place at night or in darker locales and the image holds up well, without exhibiting excessive noise (though some softness can be spotted.) Some minor aliasing is evident in the edges of glowing lights and if you get right on top of the screen, but for the most part, this is a good-looking presentation. The real draw of the Dolby Digital 5.1 track in this DVD has to be the music, as the synth score bursts forth from the surrounds, with some assist from the low-end to add punch and ground the tunes, which sound strong and bold. The clarity of the track lets the dialogue (focused mainly in the center channel) come across clearly, while the sound effects are well-defined in the mix, with some noticeable panning and discrete placement in the surrounds, which also offer up atmospherics to fill scenes out. The main extra is an audio commentary by Vesely, producer Elijah Alvarado, and Scheer. After getting into the world of audio commentaries (including discussion of commentary tropes and the bar set by Paul Thomas Anderson with Boogie Nights) they dive into the origins of the film and how it came together, including how Vesely became connected with Chance the Rapper. Scheer shows himself to be an ideal moderator, guiding the track extremely well, thanks in part to his knowledge of the production and his overall interest in film. As a result, it offers great insight into the making of the movie and making an indie film in general. There's also an 8:06 reel of 5 deleted or alternate/extended scenes, which include some bits of dialogue that didn't make it into the movie, mostly for good reasons, but more Scheer and more Carl the Janitor mean you should check this out. 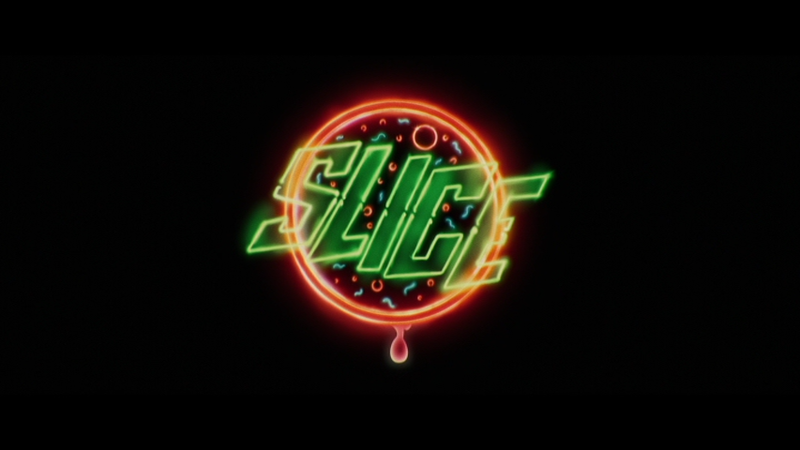 Slice is a really enjoyable bit of comedy horror, powered by a top-notch cast and genuine filmmaking style, at least until the climax, which is something of a dud, even if the film recovers to finish on a high note. But overall, it's more than worth the scant 83 minutes it takes to watch, and this DVD presents the film in solid shape, while adding in a few extras that definitely add value to the package. If you dig a silly horror film that's heavier on laughs than scares, Slice is a film that will hold up to repeated viewings to become a go-to favorite.